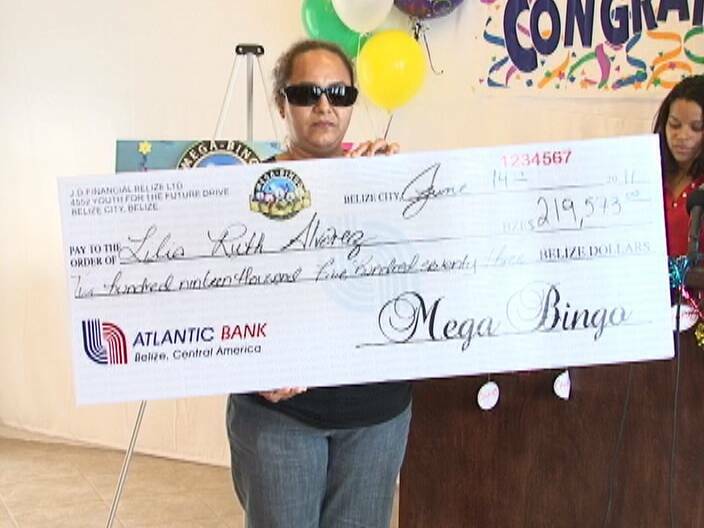 Mega Bingo today made the largest cash payout ever given in Belize’s gaming history. Players and viewers watched as the jackpot rose to two hundred nineteen thousand five hundred and seventy three dollars. When the winning ball was called last Wednesday, it was presumed that a Burrell Boom resident had won since the ticket was sold at Boom’s Lisa’s Store. 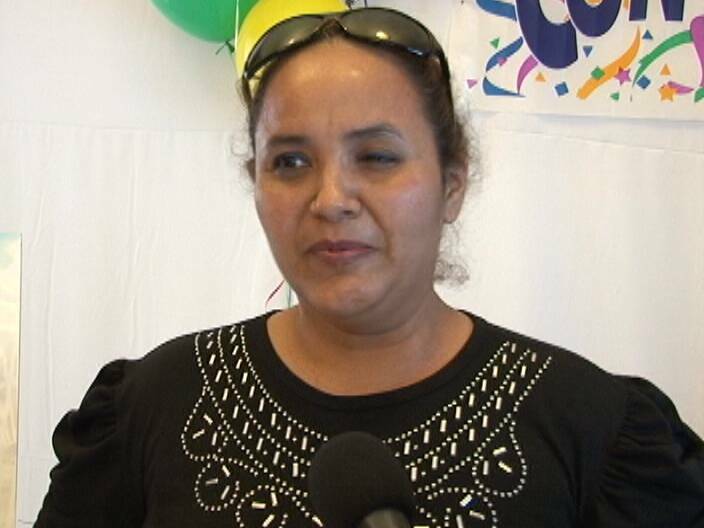 Well it turns out that a Belize City woman bought the ticket and decided to visit JD Financials on Monday evening to find out if she had won. 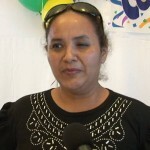 Lilia Alvarez is a single mother of four children in primary and secondary school. Alvarez is unemployed and her family was barely keeping their household together with funds from her ex. 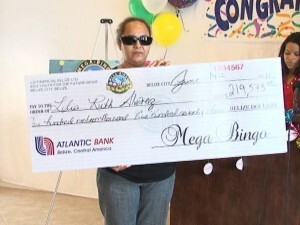 Alvarez received her cheque from the Mega-Bingo host at a ceremony this afternoon. Alvarez takes home one hundred and eighty six thousand, six hundred and thirty seven dollars and three cents after taxes. Channel 5, you should interview this woman again in a couple of years, and find out in what state she is in then. That would be a very interesting find either way! I really hope she manages her money well. These days a 186,637.00 with 4 kids wont last very long. I sure hope this isn’t a sham because rumors have it that she is being paid to say she won. I hope that she won for real because she sounds like she really needs it. People are asking how she managed to get a ticket from Boom when she doesn’t live there, but hey either way she is receiving money so good for her. Hope she manages it good and hope she realize that without a job that money will perish as easily as she got it. she def got paid to claim this prize. I honestly think this woman d idn’t win, to begin with she said “she didn’t know…” duhhhh she knew before hand she was gng to win because she was paid for saying so. It’s so sad these things happen … DO not buy megabingo, stick to LOTTO. So she’s unemployed, has 4 kids, can’t pay her bills, and spends the kids maintenance money on gambling! Oh, but she won so let’s all rejoice and follow her example. Like I said before, lotteries are a tax on poor people who are bad at math. All lotteries should be required to clearly and boldly publish the probability of winning on all advertising and at point of sale. They should also be required to publicly state exactly how much money they collect from sales versus how much they pay out in winnings. 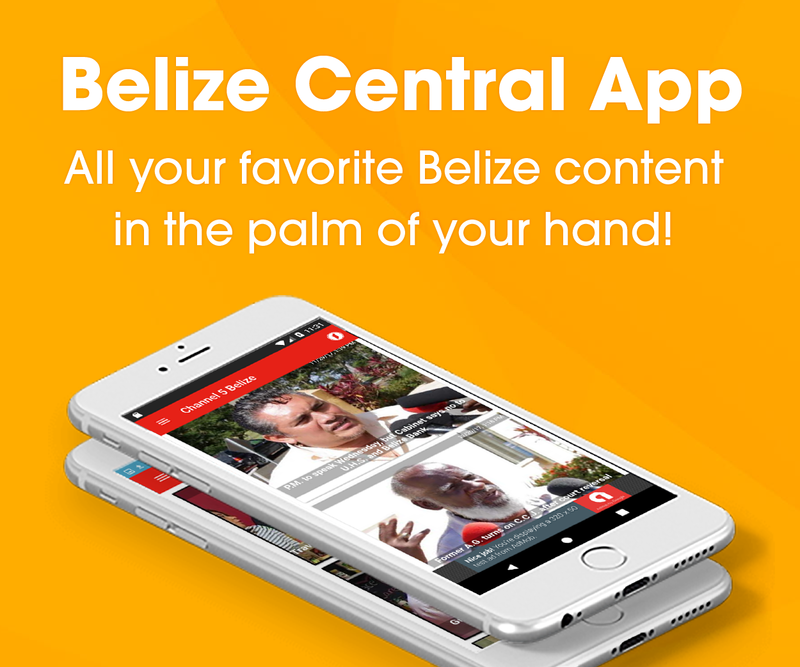 Belizeans need to understand that lotteries are not a way out of poverty. Sure, a few people will “hit the jack pot” every year, but the overwhelming odds are IT WILL NOT BE YOU! If you spend $10 per week on lotto, every week for 20 years you will spend over $10,000 and the odds of winning are 1 in 237,336. But put that same money in the credit union every week and you will have nearly $20,000 in you account. Gambling has been around forever and I have no problem with people spending disposable income on gambling for entertainment. But it irks me to no end they way lotteries are promoted and accepted as some sort of magic bullet for poverty or household financial management. No Comment but we all know what happened!!!!! Something smell like cato again ina Belize. Look like people de get “shyne” left and right by these crooks. Oscar965 you seem to have a problem bc you always calling people derogatory terms for expressing their opinion. Apparently you are an all knowing being my ignorant buddy. 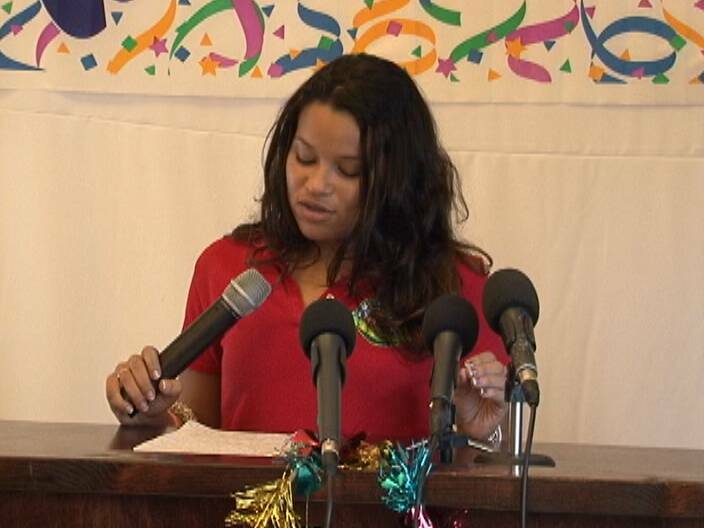 Did you hear what you said, you live in San Pedro and went to Belmopan to do what? to conduct business. Which means you doing your job buddy. 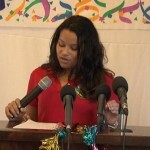 Now if you didn’t have a job, would you be in Belmopan and had the oppurtunity to buy a ticket there? I see the point that the blogger above is making, but you obviously missed it. Maybe you will figure it out later my friend, but i would think twice before calling someone stupid and losers bc you my friend is just ignorant. Like i said before, just bc the views up here don’t agree with your own does not mean that they are wrong and your are right. Only one knows it all and he is known as GOD. From her appearance she doesnt look to too happy to have won…..hmmmm…mein i would have been smiling from ear to ear for the rest of the year if it was me who won……something still seems fishy here. You do not have to live in a area to purchase a lottery ticket.I live in LA county and I always purchase Ca lottery ticket in Victorville when I am driving to Vegas.I am sure people travel from one district,town,or village travel to another in Belize. Excellent and WELL PUT @ redbwai… @ do it right … and all the other people up there that see’s that this is a SCAM. You guys leave me speechless. I could not say it better myself except that I predicted it and it happen the EXACT way I did. Absolutely nothing change from the way I said it was going to happen; it was like almost like I was a part of the plan. Mega Bingo is a big FRAUD. I DON’T and WON’T ever support them. I have been recording every game night and it’s all lies. They are just like the the other con artist in Belize taking advantage of us. After all the support we gave them, this is what they did to us. Do you know that it is a KNOWN FACT that MEGA BINGO sells 40,000 plus tickets every game night. (Forty Thousand and MORE). They SHOULD have no need to steal but they DO because they can and we allow them to. Why do you think they can say we have given away over a million back to the community… yeah right. So do the math if they have given away so much then how much are they making????. Think about it my Belizean people. Forty Thousand is the minimum that they sell. Stop given away your money. Save it because we are going to need it when the Government get done with. This is SERIOUS!!!!!!!! There was not one STREAK of excitement in that lady face, it was more like MEIN… I WISH I MI WIN THIS MONEY FI TRUE…. @ Oscar it’s not what you do you know… it’s how you do it. People could buy from anywhere but who buys a ticket in Boom, live in the CITY and takes a whole week to go collect right from the HEADQUARTER in the CITY…. come on… both you and I don’t believe that and if you do… you fooling yourself buddy. GET IT RIGHT! Something certainly does not sound right since she did not acknowledge that she bought her ticket in Boom and even thought that it could not have been her since the ticket was said to have been sold in Boom. Remember, My Legacy B4 My People. she and her kids spend the weekend regularly in Burrell Boom. that is how she sent her son to buy regular tickets while they are there. I can just picture silly people infront of their TVs playing the Bingo Game hahahaha not knowing that all this is a set up and at the end of the day, both the hosts of the Mega Bingo and the staff laugh laugh and laugh as they know all this is programmed to happened this way. Come on people, don’t let others take you all as fools, open your eyes and realize that it’s untrue. Save your $2.00 to buy your sugar and flour which have become scarce thanks to the UDP government. Grow up Belizeans!! Where is the evidence of fraud. @ Oscar i agree i live in California and i was in Belize in march and i bought tickets in boom also,so why should it matter where you live come on people use your common sense. @ unhappy you are also right when i but any kind of lottery or bingo tickets as soon as the numbers are drawn i check my tickets because if i win i want my $$$$$$$$$$$. Is it just me or did one of the ladys daughters not come out in a mega bingo commercials as one of there workers who usually gives out cheques when people win? @UNHAPPY yeh mein i agree wid u …wen u really look pan it….the whole thing looks shady…..its a big conspiracy…..i dah from boom….an me neva yet see dat lady in boom and yo kno how village pple do it…..everyone kno everyone…. Shy you hit the nail on the head. Is it just me or does this lady seem like everything was scripted and she did not know how to answer the simple questions asked by Rachel on the show. For someone that won that amount of money, she really dont seem thrilled. If its a scam and a scripted win, i hope she collected a nice figure to say she won. congratulations to the winner…!!! is all i have to say…..